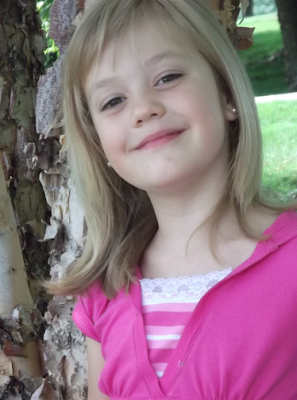 MrsP.com Announces Finalists for 4th National Kids’ Writing Contest! BIG News For One Of Van Meter's 3rd Graders! and GREAT news for our very own Meridan Boyd from Van Meter! She is in 3rd grade at Van Meter Elementary. Meridan has been selected as one of the finalists in Mrs. P's Be-A-Famous-Writer contest for her original story The Horse Indeanna. MrsP.com announced today the names of finalists in the fourth edition of its popular Be-a-Famous-Writer contest, open to kids across the country between 4-13, and two states stood out from the rest. 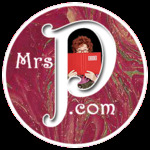 You can read about announcement on Mrs. P's website here. 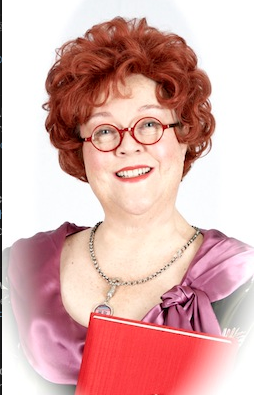 “We had wonderful entries from all over the United States, and it was hard to narrow it down to ten stories,” said Kathy Kinney, who stars as Mrs. P and who, before co-creating the website, was best known as Mimi on The Drew Carey Show. “New Jersey and Arizona both took the lead with two finalists each, which speaks well for their schools and educators. We weren’t looking for an East-West competition, but we’ve got it!” she added. The Grand Prize winners will be chosen by a panel of celebrity judges, including Academy Award-winning actress and reading advocate Julia Roberts; Melina Gerosa Bellows, the Executive Vice President and Chief Creative Officer of Books, Kids and Family at National Geographic; and Mary Frances Smith-Reynolds, who teaches second grade at Ivanhoe Elementary School in Silver Lake, CA. On January 15, 2013, the Grand Prize winner from each age group will be announced and will have their stories read by Mrs. P in videos featuring original illustrations and produced by a Hollywood production team. The videos will be posted for viewing by a global audience at the MrsP.com website. Winners will also receive a bound copy of their story, made possible by Polka Dots Publishing. Other contest sponsors include Powell’s Books and Sakura of America. Buyer Topia will donate books to the school libraries of the Grand Prize winners. Good Luck to Meridan and all of the other young writers. We are so proud of you and cannot wait to hear your stories read by Mrs. P.
This is also a message from Mrs. P on her website too. creativity with on-line games and writing contests. Its production offices are located in Portland, Oregon and Los Angeles, California. The Kindergarteners Caught The Gingerbread Man and A Few Other Favorite Book Characters! 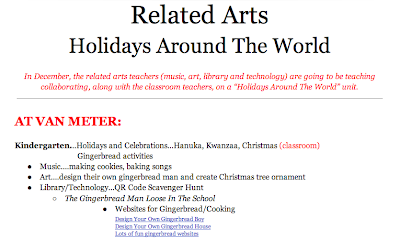 This year the related arts teachers planned a big unit together for the holidays. We focused on different topics that tied into the classroom curriculum and plans for each grade level. In kindergarten, they are looking at different "Holidays and Celebrations" like Kwanzaa, Hanukah, and Christmas. The kindergarten also starts a gingerbread unti in December and continues it through January. 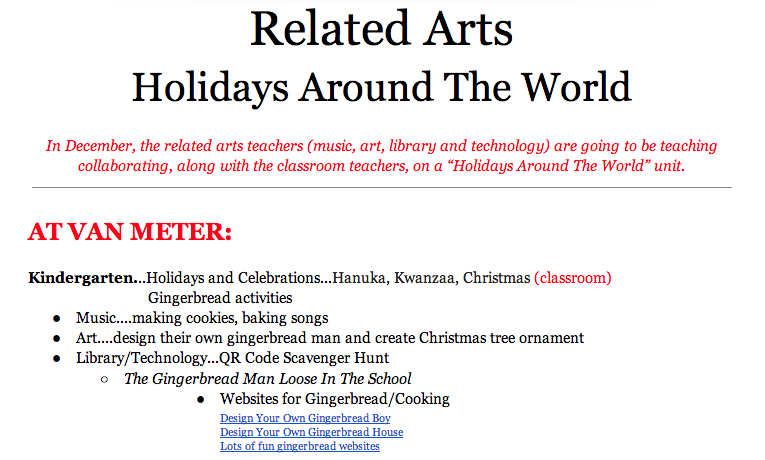 The art and music teachers, and myself, decided together that we were going to focus on the gingerbread part a little more, while tying in the holiday themes. In the music room they were going to be singing songs about baking and cookies. In the art room they were going to be designing their own gingerbread man and creating a Christmas tree ornament. And in the library....We were going to let the Gingerbread Man loose and try to find him with the help of a few book characters, QR codes, iPads, and several very excited kindergarteners from Van Meter. 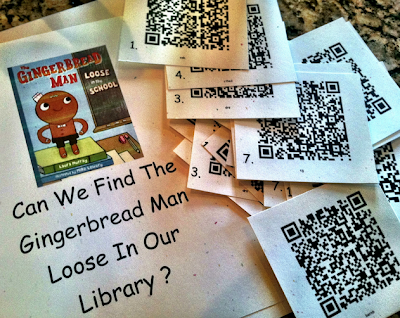 As I created the QR Code Scavenger Hunt for the Gingerbread Man, I wanted to tie in Laura Murray's wonderful and sweet book The Gingerbread Man Loose In The School. This book has become one of my favorites to share with our students at Van Meter. Last year I shared it at the beginning of the school year and we did a QR Code Scavenger Hunt to find teachers we hadn't really met yet within our district. (You can read about it in this blog post) It was so much fun and the little ones met new people, worked with their classmates, and learned about QR codes and using the iPads. This year after reading the book and showing the adorable little book trailer, I wanted to do something different. I decided to take a look at the kindergarteners classroom in the Google Doc I created for collaboration entitled "What's Going On In your Classrooms in 2012-13?" Every month they include an author or illustrator within their classroom. I focus on these in the library as well. By including these authors and the characters from their books, I would be enforcing this part of their curriculum as well as giving them another fun experience with them too. 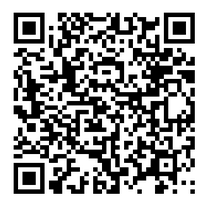 So by using the QR code creator Kaywa, I found pictures online and created 12 QR codes for the scavenger hunt. I found pictures of Dr. Seuss, The Very Hungry Caterpillar, and of course Curious George....who is actually the book series they are focusing on this month in kindergarten. As you look through these pictures, you just have to understand the excitement that was in this room. The students loved finding the book characters and authors they are focusing on in the classroom and within the library. They even found different symbols of the three different holiday celebrations within the QR code scavenger hunt. 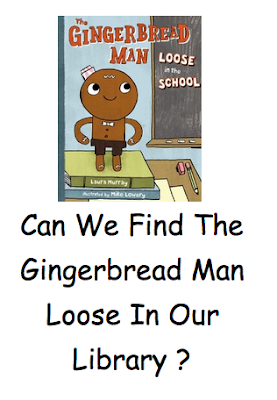 Tomorrow the Gingerbread Boy visits the other kindergarten class....I sure hope they find him too. One of the best parts of my job is the collaborating I get to do with the classroom teachers. I love sitting down with them, looking at their curriculum, and thinking of new ideas to infuse technology, creativity, and wonderful resources into our students lives. over the next two months. Janelle Thompson, one of the 5th grade teachers, was reading The Hobbit to them in class. With The Hobbit coming out in the theatre this month, she wanted to read it to them first and then have a night where they met at the movie too. 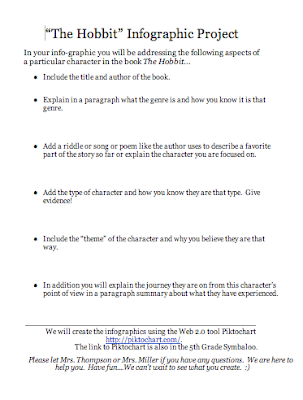 The Google Doc above is what I use with each of the grade levels as we collaborate. It is a perfect way to keep track of our ideas and the resources that we gather together. One thing that came from our collaboration that day was the need to give the 5th graders a little tool box of different Web 2.0 tools that they could use for projects. I have used several with them but there were a lot that I wanted to introduce them to this year as well. 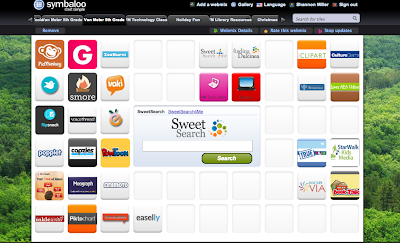 I decided that a new "5th Grade Symbaloo" linked to our "Technology/Library Symbaloo" would be the best way to share and give them access to these tools and a few other resources that they may need. 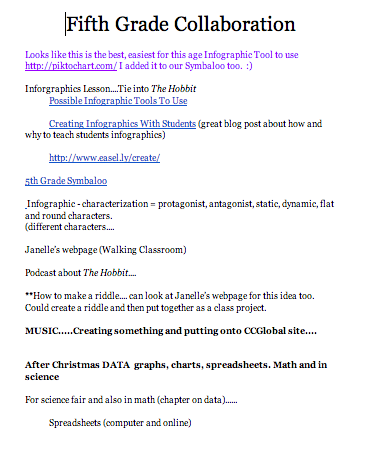 Janelle told me that she wanted to find an online tool for the students to use with The Hobbit. I had wanted to do an infographics lesson with the 5th graders. 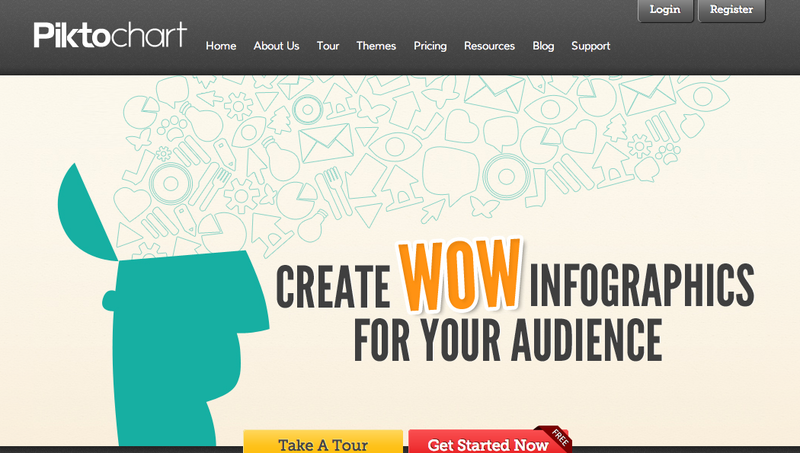 I thought this would be the perfect lesson to use an infographic tool with and after talking with Janelle she agreed. I found the infographic tool that we were going to use. 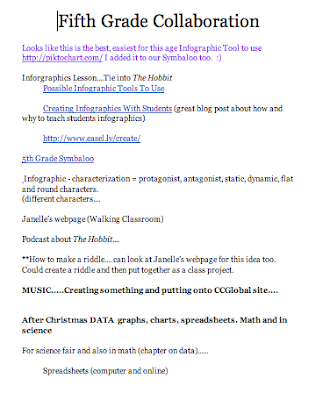 I asked my PLN on Twitter and read a few blog posts about other elementary students creating infographics. I decided to try out Piktochart. 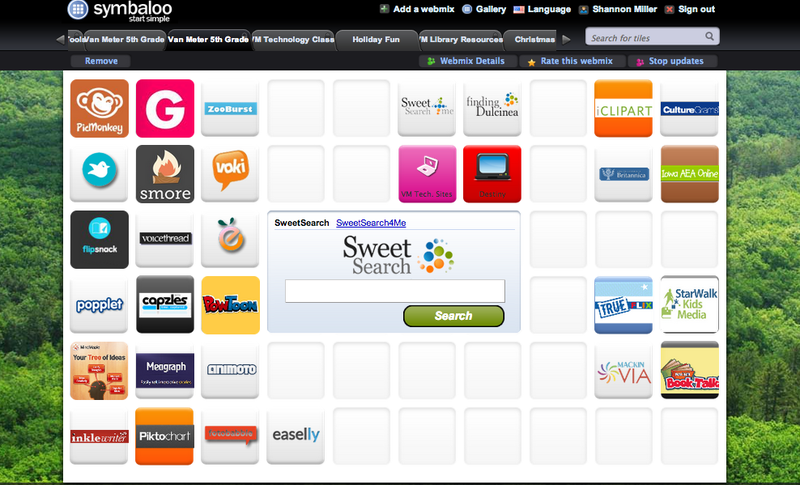 It was easy to use and had a lot of really great features for the students to choose from. Janelle typed up the requirements of the project. Since this was going to be tie into their reading and language arts, Janelle created requirements that fit the needs of their curriculum. You can view "The Hobbie Infographic Project" in this Google Doc here. We printed off these two pages and gave them to the students. This is what the students would be using as a "work space" to gather the information they needed before they started on their infographic. Janelle also created an example using Piktochart. 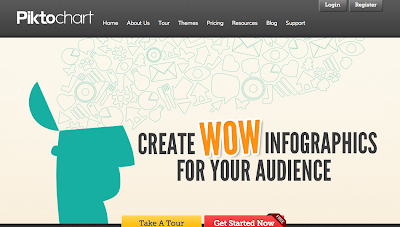 I just love how her infographic turned out....Piktochart makes such beautiful, professional looking infographics. 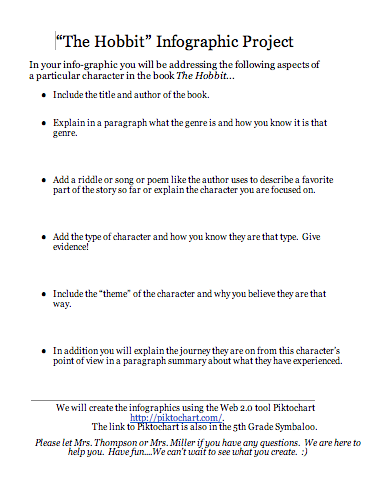 We would also be using a rubric for the assessment piece of this project. On the day that we introduced the infographic project to the students, Janelle came to the library during their library and technology time with me. Janelle explained the requirements of the project and I spoke to them about finding images and researching other information that they needed online. When we went to the lab to demonstrate how to use Piktochart, we had fun showing them the features and creative ways to design their infographic. We then came back to the library, got the laptops out, and they began their work. The students were very excited to get the information they needed wrote down so they could start their infographic. For a few of the items needed, they found their information online. They looked up great riddles and some needed help remembering a few of the characters in The Hobbit. As I walked around the library, I saw great student engagement....They were all having so much fun recalling what they had learned from the book. I especially loved when I looked over and Greta was using her iPhone for research too. 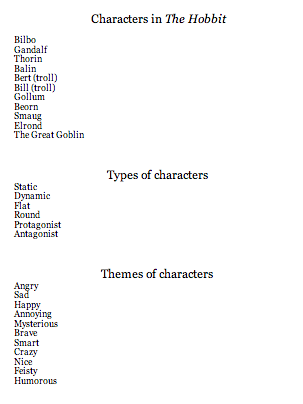 As we work on The Hobbit infographics over the next two weeks, I can't wait to see what they create. They are very excited for their work to be published online and to share with all of you.